Earlier this week, the Farrell Review – alongside RIBA and Cabe at the Design Council – hosted a fringe event at the Labour Party Conference to discuss the recommendations of the Farrell Review. Chaired excellently by Chris Rumfitt, CEO of Corporate Reputation Consulting, the discussion ranged from education and the role of the arts, to proactive planning and the importance of placemaking. Most importantly, the debate focused on how Government, policy-makers and industry can work together to improve the quality of the built environment and provide greater leadership in these areas. Sir Terry Farrell led a panel which included RIBA President Stephen Hodder, Design Council CEO John Mathers and Helen Goodman MP, Shadow Minister for Culture, Media and Sport. 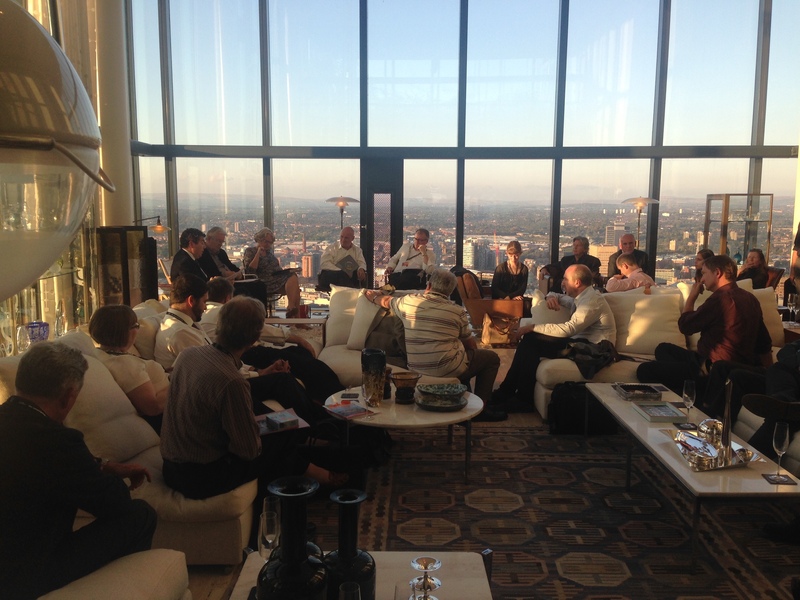 Hosted by architect Ian Simpson in his stunning penthouse home in Manchester’s Beetham Tower, the panel was joined by an audience of over fifty Conference delegates – including MPs, journalists, local government officials and industry. With the Scottish referendum still fresh in everyone’s minds, one of the key topics for discussion was how to further devolve local planning decisions and empower cities and local communities to engage in the planning process. Helen Goodman in particular highlighted the importance of good placemaking for cities and the regions and Design Council CEO John Mathers argued that Oxford was a classic example of the success of ongoing place-making and design support. Sir Terry Farrell called for greater engagement early on in the development process through the adoption of a radically more pro-active planning system. Panellists agreed with the Farrell Review recommendation discussed the need for ‘Urban Rooms’ across all of the UK’s towns and cities as a place for people to become involved in debating the built environment of the cities in which they live. Helen Goodman agreed with the Farrell Review suggestion that money from developers’ S106 agreements could go towards funding the establishment of urban rooms funded. The fringe event coincided with the announcement that the first Farrell Review inspired Urban Room is set to open in Blackburn next month, with further urban rooms set to open around the country. Discussing the Labour Party’s pledge to boost the rate of housebuilding, panellists and participants alike agreed that design quality was integral to delivering new housing targets. Helen Goodman called for more design competitions to raise design quality and to make design a central feature of deciding who takes forward projects. The Shadow Minister also backed the Farrell Review’s calls for a major international architecture festival, but argued that it should be held outside London. Overall, the fringe event was a lively and passionate discussion about the future of our built environment and how industry and government can best work together to implement the recommendations of the Farrell Review. The team is particularly grateful to Helen Goodman MP for her involvement and for the announcement that she is “totally committed” to the Review. The Farrell Review, RIBA and Cabe at the Design Council will host a similar event next week at Conservative Party Conference and will be joined this time by Hon Ed Vaizey MP, Minister of State for Culture and the Digital Economy. The event is open to all so please join us if you can!